The images of the World Trade Center towers crashing to the ground on Sept. 11, 2001, have been burned into history and on the collective memories of the world. Lost on that day were 343 firefighters who ran into the buildings while many other people ran out of them. The Cheney Fire Department has found a way to commemorate those firefighters and remember the sacrifices first responders everywhere make daily. Chief Mike Winters received a news release in 2009 from the Port Authorities of New York and New Jersey offering pieces of the former towers to communities. “I thought it would be pretty neat to have a piece of it,” Winters said. He applied for the piece and had to wait. Winters said there was a backlog of orders. The rubble from the World Trade Center was also part of an active crime scene. Much of it was stored in a warehouse at John F. Kennedy Airport in New York and had to be released by the district court before it could be sent to Cheney. Some of the steel from the buildings was used to build the USS New York, a San Antonio-class amphibious transport dock launched in 2007. Winters said he didn’t know what he was going to get, but requested something about two feet by two feet. 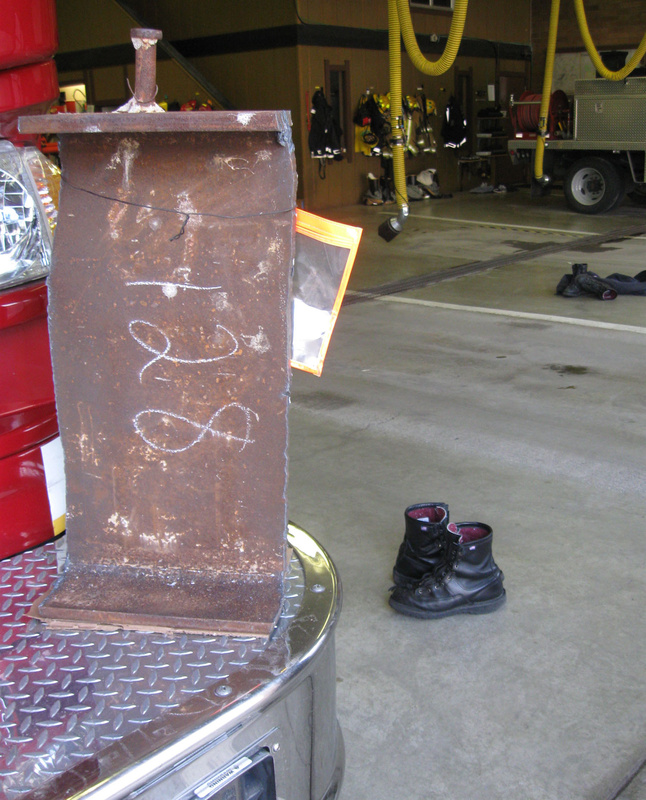 The department received an iron piece that weighs about 50 or 60 pounds. “It’s pretty sobering to have something like that in Cheney,” Winters said. He said he thinks of those 343 firefighters who were on the stairs when the buildings fell when he looks at the artifact. “Our guys sacrifice a lot to save lives and people,” he said. The department will set up a permanent display of the artifact and hopes to have a ceremony on Sept. 11, 2011, the 10th anniversary of the attacks. “I’m happy and proud to have a piece of that here,” Winters said.